2016 has come and gone and we're well into 2017. I haven't been posting as much as I could have, life just gets in the way sometimes. To recap last year: 8 more goats to the project, now through the fabulous Global Friends Foundation so my total is now 25 goats!! I joined the Burlington Fibre Arts Guild at the AGB and participated in their sales and All Guilds Show last year. I also had a piece (well, 3 pieces really - my set of turkey vultures) in the All Guilds Show for the potters as well. I had a successful Garden Show at my studio and for the first year ever, my studio was a location for the Milton Studio Tour in October. 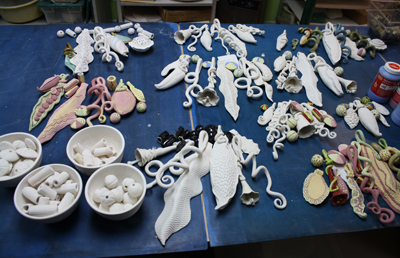 I was kept busy with workshops in my studio as well as teaching sessions of pottery and felting in Oakville and Burlington. Artistically, it was a really good year. Onward into 2017! My piece that was accepted for the All Guilds Show at the AGB last April/May for the BFA guild. These were my 3 vultures that hung above everyone's heads in the AGB All Guilds Show last year. 2015 Wrap up. Onwards and upwards for 2016! 2015 was a great year for me. My first year in my new studio, which I love, love, love! I had much fun with felting and pottery workshops and I think my participants did too. I have had great fun over the past several weeks giving felting workshop in my studio. The space is working out well and I have replaced the portable air conditioner with a window one that ACTUALLY WORKS so that has helped tremendously in the stifling heat we had late July and earlier this month. I am looking forward to these August and September days being cooler and being able to have windows open to enjoy the summer breezes. And here are some of the tapestries created in recent workshops - amazing!! I've put up another bunch of workshops on the workshops page, so if you're interested in creating your own masterpiece (no experience necessary!! ), please let check it out! I was saddened to hear that after over 50 years, the CHF has stopped operation at the end of July. I feel privileged to have been part of their fundraising effort, having bought 17 goats in the past 2 years. I am now going to have to find another avenue for my fundraising efforts, as I really want to continue to help those in need. Any suggestions anyone?? I'm up to 14 goats and close to getting a 15th. Woohooo! I've gotten a pottery and fibre piece accepted in a curated show at the Art Gallery of Burlington. The All Guilds Show runs until May 24th in the Lee Chin Family Gallery. More details here. I'm working madly on the inside of my studio to get it ready for workshops and my June 20 & 21 Garden Art Show and Sale. Here's a pic of the outside (messy! with tools & gardening stuff scattered about). It's a gorgeous building (built and installed by www.limestonetrail.com in 2 days!!) and I'm painting the ceiling, then putting up cedar tongue and groove walls, installing light fixtures (although with all the windows, it's beautifully bright in there during the day! ), etc. I'm pricing and packing work for the Hamilton Potters' Guild sale starting this Friday. More details on the sale here. The yard's a mess after having it dug up to move the septic line last year. The heavy equipment totally destroyed the lawn. That definitely needs more work - regrading and reseeding. Also a pathway to the new studio is in the works. And planting a vegetable garden along the right side of the studio, and...... oh the list just goes on and on and on... I try not to look at the list of stuff to do, it's a bit overwhelming. I just keep telling myself it'll be awesome when it's all done! With the last 2 sales, I've sold enough lady bugs to buy 2 more goats for Ghana! I'm now up to 7 goats. Not a huge number yet, but it's adding up... Thanks to everyone who purchased lady bug pins or earrings at Kaleidoscope in Burlington and at my Garden Art Show and Sale on June 14th. Lady bug pins, earrings and name badges as well as tree frog badges. If you want to help, please purchase a pin or earrings today! 2014 Garden Art Show a Success! The deck with the art works of Lou Hanson, Bonnie Sylvia and mine. Lots to see! One of my totems now has a new home in this lovely setting. Thanks CM for sending this photo and allowing me to share it. Bonnie - pretty as a flower! Vera Rehill's jewellery, Sue Firkser's fibre and the wrapping tent. A collection of my new ceramic flowers that made their debut on Saturday. I'm in Natural Landscape Magazine! I'm thrilled to be featured in the spring 2014 edition of Natural Landscape Magazine! I have a double page spread in the discover district section of the mag. Lori Sweezey (who's SUCH a nice gal), wrote a really fun article about my tree bling. Check it out if you can. NL mag is available at Chapters and Indigos across Canada or from NL directly here. Last fall I decided to give some back. I contacted the Canadian Hunger Foundation and discovered their Goat program. Seeing as goats are near and dear to my heart (being one, and all - see bottom of the Goat Project page for details), I thought this was a perfect match! Lady bugs - totally cute! wear one on your cuff, shoulder, shoelace, hat, scarf, wherever - and see if anyone notices! So I started donating $5 from the sale of each ladybug pin or earrings, or frog name pins towards this project. So far, I've donated 6 goats and am on my way to having enough for a 7th. Hot Bling - snow's starting to melt! 3 new pieces of bling are unveiled. So I've finally gotten around to setting up my website. It is still a work in progress but the bones are there. I will be adding to it regularly, now that the hardest part (getting started) is done. I hope you enjoy!